Ever wonder how guitar icon Slash learned his gritty riffs and snarling leads? 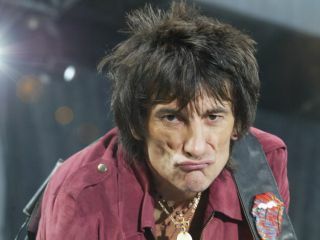 According to Rolling Stones guitarist Ronnie Wood, it all came from him. Speaking on his new Absolute Classic Rock radio show, Wood said, "Slash, I remember him as a kid spying on me when I was playing guitar, and I'd teach him little licks." While Wood didn't go into any detail as to how young Slash came to spy on him, it is true that the ex-Guns N' Roses guitarist was born in England and did live there before moving to American when he was 11. In other words, anything's possible. Wood was quick to toss a bone Slash's way, saying that he's now "learning licks off him. It's really good. He's a great guy to play with, and he's great at interacting, a good weaver, you know. We can weave, like me and Bobby Womack do, and me and Keith Richards do. "Slash is such a great talent," he added, "and he plays in my solo band when I take it out. He's on my new album as well." Ronnie's Wood's website states that a new site, as well as a new album, I Feel Like Playing, are coming soon.